In addition to the emailed and downloadable versions of our Bits & Bytes newsletter, key dates and notices are also available in our classrooms at Craig Hall. Classroom hosts will periodically make announcements before class and share highlights from our most recent newsletter edition. Our goal is to keep you informed whether or not you have computer access, and we’re grateful to those who’ve volunteered their time to assist in this effort. 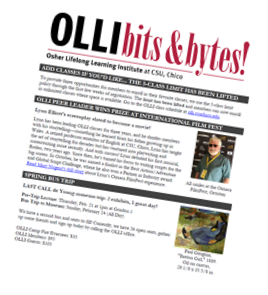 If you have something to say, a photo to share, or a question to pose to the editor, you can submit information using our new “OLLI Newsletter Submission” form.